Growing up, Brent David Toadlena watched his paternal grandmother making moccasins in her hogan near Chinle, Arizona, on the Navajo Nation. Today, he lives in the small mountain community of Shash Bito' —Bear Spring — his maternal grandmother's home base, near the Chuska Mountains and Canyon de Chelly. Brent’s artistic talents eventually landed him a coveted spot at the renowned Institute of American Indian Arts in Santa Fe, New Mexico. After a career as a school counselor and making art on the side, he ended up back home. With his grandmother gone, people in the community started coming to Brent for moccasins. Today, he tans his own deer hides, repairs and refurbishes moccasins, and creates new custom-made moccasins with traditional materials including hand-tanned buckskin and vegetable dyes, using traditional sewing techniques. He makes them one pair at a time, completing one to two pairs a day. “You can walk into a store and buy mass-produced commercial moccasins, but it’s hard to find Navajo moccasins handmade by Navajo artists,” explains Brent, who has demonstrated his art at the Navajo Nation Museum in Window Rock and elsewhere. Through his small, home-based business, Ashkii Bida’ Moccasins and Art, (Ashkii Bida’ is Brent’s nickname back home, where he’s known for being the uncle to a particularly spirited nephew), Brent offers custom-fit moccasins at a range of price points. Unlike the generic sizes commercial off-the-shelf moccasins are found in, Brent traces his customer’s feet and makes the moccasins to fit. Brent’s moccasins range from simple, functional, ankle-high models in rich red suede that take about two hours to create and retail for $100 a pair to wrap-around leggings made of hand-tanned deer hides. A pair like this can cost up to $700 depending on the amount of labor and the cost of materials required. Through his Facebook page, Brent has expanded his customer base outside of the local community. 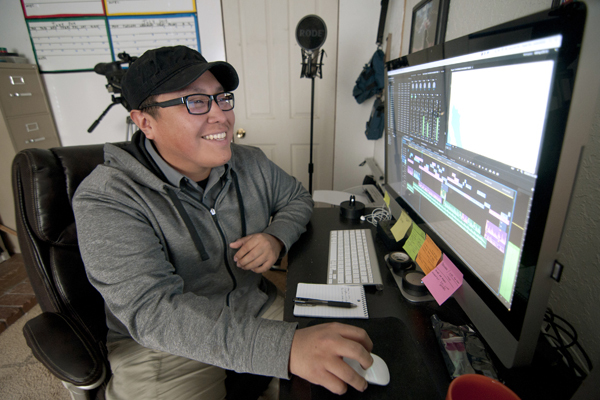 Now, as one of 10 entrepreneurs selected for mentoring and advising through the Native American Business Incubator Network (NABIN) in 2018, at a recent Create and Elevate event he was paired up with graphic designer Vanessa Bowen of Bowen Creative who helped him design a logo and brand his business, assets that are paying dividends now as he launches a new website. He also got some ideas about other ways to market his business. While Brent ponders just how busy he wants to be, and weighs the possibility of bringing on part-time help, perhaps opening the door for another young person to learn the ancient art and trade of moccasin-making, the web designer NABIN hooked him up with is putting the finishing touches on a new website for Ashkii Bida’, so that customers across the reservation and beyond can get a better look at his wares. Brent, as a NABIN member, is part of a network of small, local, sustainable businesses owners who are changing the face of the Navajo Nation economy.